The greatest living Dodger sets spring training camp abuzz as he returns to work. ‘I’d like to see this organization be a winner again…. I thought, if I can help, it would be fun,’ Koufax says. Shortly after noon Sunday, a black SUV pulled up at the front door of Camelback Ranch amid the breathless aura of a royal homecoming. Two Dodgers employees were waiting on the curb. Several others were staring out from inside the main building. Out of the car stepped a wiry, deeply tanned white-haired man wearing black sweat pants and a long-sleeve white shirt. He took off his sunglasses to reveal bright eyes over a huge smile, and here came the whispers. 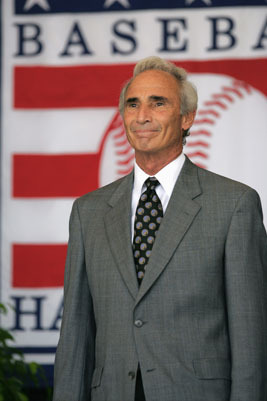 Sandy Koufax, the greatest living Dodger, was officially returning to work for the only baseball home he’s ever known. The intensely private former pitcher arrived at spring training to begin a two-week stint as a pitching instructor as part of a one-year contract that will put him back in a Dodgers uniform for the first time in more than 20 years. On a clear and sunny day in the desert, chills were everywhere. When Koufax walked from the main building to a practice field in his sweats, the camp buzz became a dull roar as a couple of hundred fans rushed the ropes to welcome him. When he stepped onto the grass toward the pitching mound, Clayton Kershaw hugged him. When he began supervising pickoff plays with several pitchers, most of the folks in camp had turned to watch. Nearby, Dodgers marketing boss Lon Rosen was speaking on the phone to Dodgers partner Magic Johnson. After a short session in which Koufax actually mimicked a pitching motion — fans murmuring at the sight — he signed a couple of dozen autographs and briefly stopped to answer some questions. Such as, why? And why now? Koufax was offered the spot last summer by Rosen and team President Stan Kasten in an impromptu meeting in a suite during a game at Dodger Stadium. The new Dodgers ownership is eager to reconnect with former Dodgers legends, and was hoping that Koufax would be willing to sacrifice some of his beloved privacy to bring his baseball life full circle. In typical careful Koufax fashion, he agreed only after much thought, and kept the agreement short. Since his stunning retirement in 1966 at the height of his career — he was only 30 — Koufax has taken other chances with his home team, but they have always ended uncomfortably. He was a minor league pitching instructor from 1979 to 1990, but he quit over unhappiness with the direction of the organization. For the next decade, he rarely represented the Dodgers in public, finally officially disassociating himself from the Fox-owned team in 2003 when he was unhappy with how he was portrayed in a New York Post story about rumors of his personal life. Fox and the Post had the same owners. Frank McCourt brought him back a year later, but he remained on the fringes, and actually showed up more frequently in other team’s training camps until the new Dodgers owners made their pitch. His words Sunday sounded like those of a man who, in his later years, believes it’s finally time to put aside past disappointments and revel in his roots. The number of times a Dodgers story contains one quote about playing with Jackie Robinson and Gil Hodges and Duke Snider and Don Drysdale and Tommy Davis and Willie Davis and Maury Wills? How about never? Much of Koufax’s value lies in his unmatched ability in bridging the gap between past and future Dodgers greatness. Just ask Chris Capuano, who worked with Koufax on Sunday and has relied on his wisdom in the past. For now, the Dodgers will celebrate the direction that Koufax’s presence takes them. He is their glorious past become their promising future. Of all the remodeling done by the new ownership in the last year, this could be its finest addition. Sandy Koufax was asked whether he felt as if he finally was coming home.